'Easton', the Evelyn Marshall Field Suarez estate built by David Adler in 1931 in Muttontown, pictured in 1935 and 2009. E.M.F.S. built this house after her divorce from Marshall Field III, owner of 'Caumsett' in Lloyd Harbor, and before she married Diego Suarez (where the two would go on to move HERE). 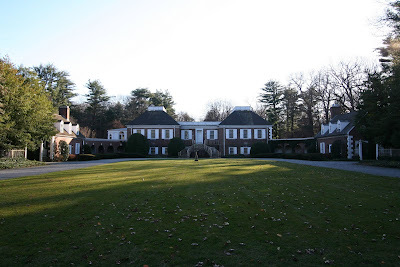 The estate was carved out of property belonging to 'Knollwood' next door. The house was landscaped by Innocenti & Webel. In 1951 the estate was sold and in '53 the central portion of the house was razed. A smaller interpretation of the house (based on Robert E. Lee's birthplace 'Stratford Hall') was rebuilt on the old foundation in 1989. Click HERE to see 'Easton' on google earth. The entire 2nd floor(bedrooms), not just the central portion, was removed and the 1st floor (living , dining library etc ) was gutted, fireplaces everything! Ive heard some of the interior elements from these 2 floors have been reinstalled in one of the flanking cottages. Of all the houses on LI that could have undergone major restoration during the last 20 of uber prosperity how did this house miss a chance at rebirth? It looks scalped. It's charming now but feels strangely incomplete, even if you don't know about its earlier incarnation. Amazing. Another pitch-perfect work by the brother/sister team of architect David Adler and innovative decorator Frances Elkins, and compromised by the new center block. The new building isn't so much bad as it is just not 'right'. one shouldn't tamper with perfection, but people just can't, can't can't help themselves. It's my understanding that the library is in a house down the road. I was only 14 when I first saw pictures of this house, in an article in a 1930's house and garden in my grandmother's library. Even then I could tell that this wonderful synthesis of the great Virginia plantation houses (a little Stratford Hall, a little Shirley, some Westover and Carter's Grove, shake well with Monticello, and voila, a subtle house that rises well above pastiche. The interiors were sensational...a classical arcaded front hall with a zenitherm and aluminum deco floor, cove ceiled library....sleek and chic. Too bad the next owners didnt' entirely see it. It certainly doesn't help that no effort has been made to replace (at least demi-mature) trees in lieu of the old ones lost from the forecourt lawn. Why are people of today so adverse to proper plantings? It's as if they almost want the homes to stick out. The reworked - and visually odd - facade simply needs help. the original home was gorgeous, no? had a sort of farm type, compound feeling. the renovated home just looks bad. the pool house is amazing i would love to live there. Easton just sold for 20M to a Chinese investor. There has been an ongoing lawsuit with the former owners of Easton, and the Village of Muttontown regarding a subdivision. The Village lost the suit, and the property will be subdivided. I just hope that they carve out some land along with the mansion, and don't demolish it.